For many full-frame Nikon shooters the appeal of a mirrorless camera had been tempered by the though of having to invest in and master a new system by moving to another ecosystem such as Sony. For those awaiting a mirrorless system that utilized Nikon imaging technology and ergonomics, the wait is over. 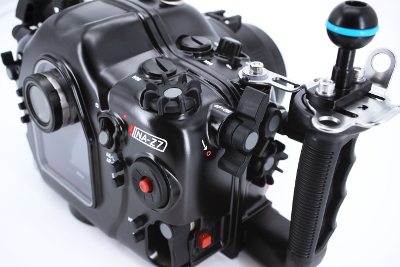 The Z6 and Z7 cameras feature an identical body, differing only in their feature sets, an ideal feature when it comes to housing the camera for underwater use. Both camera bodies are built around the new Z-mount. With an incredibly wide 55mm mount diameter (17% larger than F-mount) and very short flange distance, the Z-mount is able to offer a maximum aperture of F0.95. While the current range of Z-mount lenses is limited, almost the entire line of F-mount lenses is usable with the optional FTZ Adapter. When using the adapter, even non VR lenses benefit from the camera's in-body stabilization. VR and Z-Mount lenses receive 5-axis stabilization whereas non-VR F-mount lenses have access to 3-axis stabilization. There is also a dedicated e-VR (electronic VR) that combines optical and electronic stabilization for video shooting. Both the Z6 and Z7 are able to capture internal UHD 4K at 30fps or 1080 HD at up to 120fps at 144 Mbps. Capture uses the full-width of the sensor and both cameras are capable of outputting 10-bit N-log UHD 4K over HDMI that supports start/stop control. The OLED electronic viewfinder (EVF) of both the Z6 and Z7 gives 100% frame coverage at Quad-VGA (3.69M dot) resolution. When triggering external flashes, both cameras feature a 1/200 X-sync shutter speed. 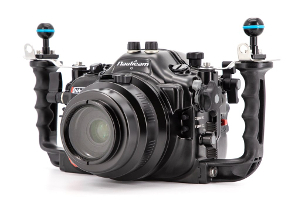 Nauticam has produced a variety of housings for Nikon DSLR cameras and is not new to the mirrorless format. Nauticam has created housings for mirrorless full frame, APS-C and MFT format mirrorless cameras from a variety of camera manufacturers. 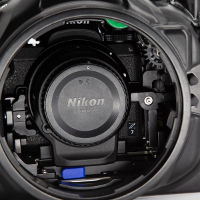 The NA-Z7, just as Nikon's Z6/7 cameras is an evolutionary step in underwater housings blending the Nikon F mount and new Z mount seamlessly in one housing. The Nauticam NA-Z7 housing allows not only the use of the new Z mount Nikon glass but also the F mount lenses with the Nikon FTZ Adapter. This is critical as the new Z mount lenses are being phased in over the next few years. 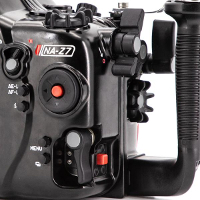 The Nauticam NA-Z7 housing features two lens release buttons that correspond to either F or Z mount lenses. When switching between F and Z mount lenses, the camera must be removed from the housing to remove the adapter. 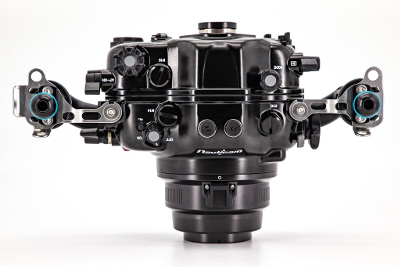 When working within either the F or Z mount system use the appropriate lens release button to switch lenses without having to remove the camera from the housing. A vacuum system reset switch is located below the tray as well so there is no need to open the rear of the housing during lens or port changes. The NA-Z7 is part of the N120 port system which allows for full support of Nikon F mount lenses with the same ports needed for their application on Nikon SLR housings. 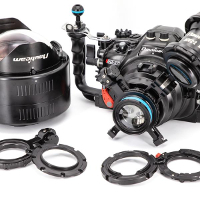 As Z mount lenses become available Nauticam will add supported configurations. Nauticam engineers are obsessed with functionality and this is evident in the location of essential controls. Regardless of where the control is located on the camera, the Nauticam housing puts them where you need them to be underwater. 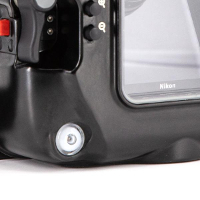 For those switching between photo and video modes, an easily reachable switch is located on the right rear of the housing. The right side double thumb lever, easily reached from the right handle features access to the AF-on and Record buttons respectively. Between the double thumb lever and the multi-stage shutter release is an ISO lever allowing quick changes to sensitivity. The left double thumb lever accesses the DISP and Playback controls. The Zoom In and Zoom Out controls, located on the right rear of the camera body is relocated to the left side of the housing to a location more familiar to Nauticam housing users. 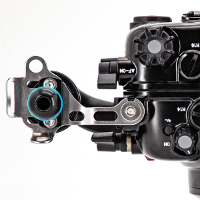 The switch that allows for switching between the LCD display and the EVF, a crucial and much used control with mirrorless systems is located close to the left handle within easy reach. Front and rear control dials are readily accessible by the familiar large knurled dials at the right handle. The ergonomic housing handles are rubberized and feature stainless steel stiffening brackets to ensure a stable platform when using large strobes or video lights attached to the pre-installed 1" mounting balls. Unveiled on the very first Nauticam DSLR housing in 2009, this locking lever has become a signature of the Nauticam brand. No twisting or threading action is required to mount a port, and it locks securely in place with this lever. Nauticam also offers locking port extensions, meaning a dome will never twist, even when used with a long extension ring. The NA-Z7 supports the FTZ adapter and belongs to the N120 Port System meaning Nikon F Mount lenses can be used with the same ports and extensions as on a Nauticam Nikon DSLR Housing. 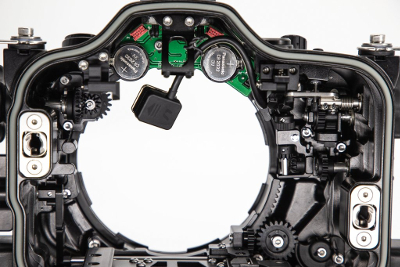 As Z mount lenses become available, supported lenses will be integrated into the port system. Nauticam engineers have placed all essential controls within easy reach of the rubberized ergonomic handles. Regardless of location on the camera, housing access is located where you need it most to capture fast changing underwater scenes. Stiffening handle brackets are included with the housing. These brackets eliminate any flex or wobble when using big strobes, and provide multiple attachment points for lanyards or other accessories. 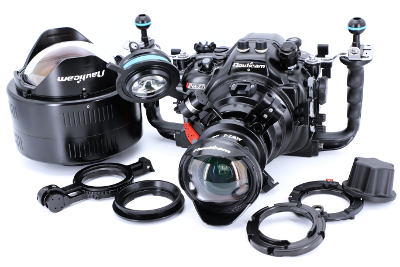 The NA-Z7 supports many of the corrective wide angle and magnifying macro optics in the Nauticam lens lineup. F mount lenses, paired with the FTZ adapter can be used with the same extensions and ports as on Nauticam N120 Nikon DSLR housings. The NA-Z7 features Nauticam's vacuum check and leak detection system electronics preinstalled. When paired with the M16 Vacuum Valve II, which is pre-installed (25625). the system gives a visual indicator of watertightness with the integrated multicolor LED. 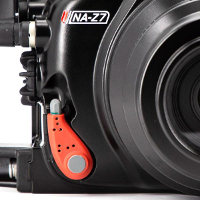 The NA-Z7 comes with Nauticam's self powered manual flash trigger preinstalled. 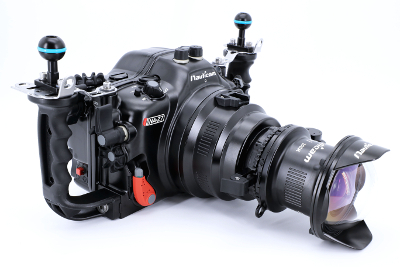 The flash trigger plugs into the hot-shoe of the camera and uses LED lights recessed into each of the two optical bulkheads to trigger supported underwater flashes when used with the correct fiber optic connection. The flash trigger is powered by coin cell batteries that provide thousands of flashes per battery. The flash trigger can be upgraded to support TTL triggering (PN 26308 TTL Converter for Nikon). The Z7 camera supports 10 bit HDMI video output at UHD resolution (3840 x 2160) at up to 30p. An external monitor or recorder can be used with the optional standard M16 HDMI bulkhead (PN 25033), HDMI (D-C) cable in 190mm length (PN 25036) which come standard in any Nauticam monitor housing package.